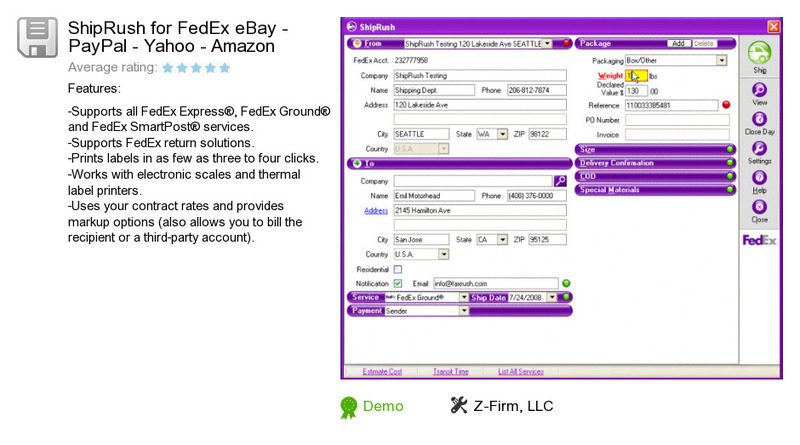 ShipRush for FedEx eBay - PayPal - Yahoo - Amazon is a product developed by Z-Firm, LLC. We know of versions 9.5, 8.0, 7.5, 7.0, 6.2, 6.0. Version 9.5.0.48348 is available for download at our site. ShipRush for FedEx eBay - PayPal - Yahoo - Amazon package has a size of 45,869,058 bytes.